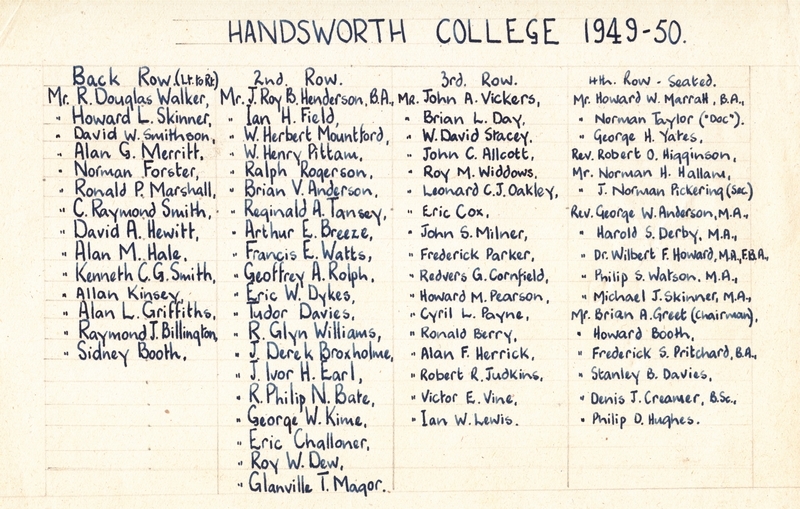 I recently acquired a number of Year Photographs from Handsworth College which also have the names of those pictured. This one is from the year 1949 – 1950. I have added the names so that these will be indexed on the site. Mr J Roy B Henderson B.A. Mr Howard W Marrall B.A. Rev George W Anderson M.A. Rev Harold S Derby M.A. Rev Dr Wilbert F Howard M.A, F.B.A. Rev Philip S Watson M.A. Rev Michael J Skinner M.A. Mr Frederick S Pritchard B.A. Mr Denis J Creamer B.Sc. My dad was Ralph Rogerson and also had a B.A. even though this is not attached next to his name. Prior to becoming a Methodist Minister he was a RAF Commando where he spent time in Malaya at the end of the 2nd World War , along with a colleague he started a Women’s Hospital as there were no facilities there at that time. He was an amazing speaker for God and the churches he ministered to all thrived. My dad died in Whitchurch , Hampshire 6 weeks before retiring home to his loved WIDNES in 1989. He is sorely missed by everyone who knew him ,especially by his wife Elsie who remained faithful to him until she died last year 2017 and by myself. Delighted to see this photograph (I also have a copy) on the website. My father was Arthur Edward Breeze. My father was C Raymond Smith. I’m writing his ‘story ‘, starting with a timekeeping. He left for college 1948 and his first ‘post ‘ was Manchester Central Hall as assistant industrial chaplain with papers and pictures dated 1951. How long was the training for ministers then? Any more info gratefully received. I have pictures from Kinver and press cuttings about a bowls game!? This photo fills in a little of the family history. Some people have been slightly confused as to whether my father was on the staff at this time. 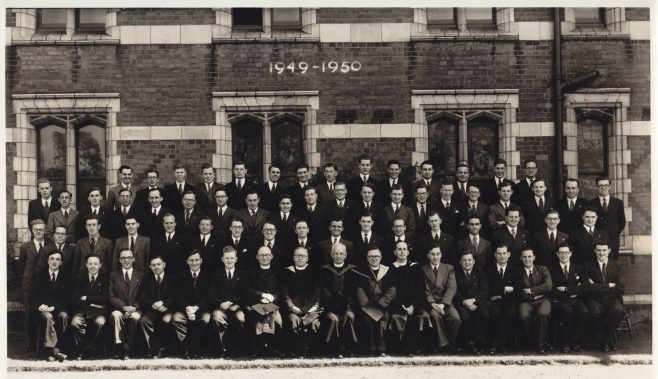 He was ordained at Conference in 1949, but remained a student for a further year to complete his Bachelor of Arts in theology. Hence “Rev. R O Higginson”. Handsworth College Football Team c1949.